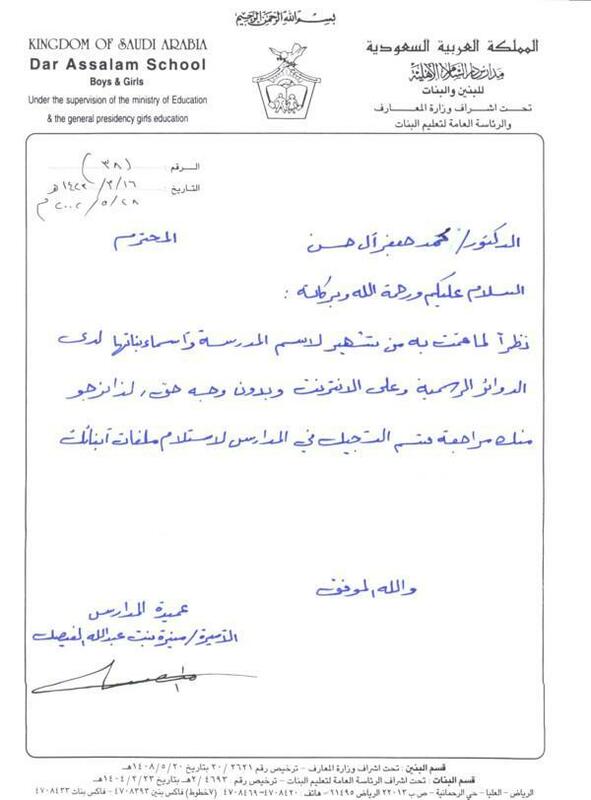 Letter from School "My Kids are NOT Welcomed Any More"
I have received this letter from Dar Alsalam Schools (from the owner of the school, Princess Munira Alfaisal) just today (Monday, June, 03, 2002) and the letter was dated few days earlier (May, 28, 2002) asking me to take my kids out of the school because they are not wanted anymore. That’s due to the publishing of the information regarding what happened to my kids. They want to revenge from me, through my kids who were victimized before, and now victimized again, instead of getting fair treatment as Saudi Citizens. Instead of firing the teacher and apologizing to me and my kids, the answer comes out clear, that my kids are not welcomed anymore. Unfortunately, what happened assures everyone that justice for me and my kids is far from being a reality.